After the enjoyable but relative misfire of ‘The Curse of the Black Spot,’ Doctor Who returns to form with another standalone episode that proves just how spectacular a single episode can be without tying into the underlying plot threads. ‘The Doctor’s Wife’ is an emotional masterpiece, easily accessible to casual viewers while offering a much deeper and more rewarding experience for long-time fans as well. Writer Neil Gaiman takes an ingenious and audacious concept- transferring the very heart and soul of the TARDIS to a conscious being and giving it a voice- and offers a wonderful exploration of the being who has been by the Doctor’s side since the beginning so very long ago. Appreciating that there will always be some viewers who detest anything that changes the very core mythology of the show, the revelation that the TARDIS chose the Doctor on Gallifrey and has actually been in control of the destinations over the years rather than the Doctor struggling to control and navigate is an absolutely superlative one. There’s a bigger story to tell, though, and Gaiman manages to create a very rich and often scary world in very limited space. Following a Time Lord distress call in the form of a cube that hearkens back to the Second Doctor serial ‘The War Games,’ the Doctor ends up on a planet where an entity going by House- megalomaniacally voiced by Michael Sheen and assisted by him quirky patchwork people- feeds off of the remains of other TARDISes it has lured to his junkyard. Things quickly become personal, then, as the Doctor is confronting a slaughterer of his own race, hauntingly portrayed as the Doctor opens up a cabinet full of distress cubes. It’s the continued nods to the past- without feeling burdensome or forced- that make ‘The Doctor’s Wife’ such a rewarding episode. This episode spends a fair amount of time inside the TARDIS as Amy and Rory undergo another mental and emotional battle against the disembodied House, and seeing Eccleston and Tennant’s version of the console room archived deep within is a fantastic treat. Even just the casual mention of the Doctor always pushing the doors open despite the sign saying ‘pull’ is a lovely nod to fans. 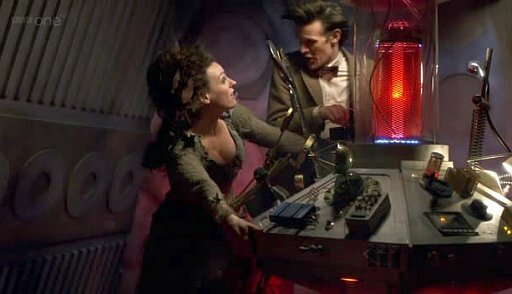 The humour as Amy realizes that the TARDIS has a body is sublime as well, but it’s the Matt Smith’s dark determination throughout, especially as he attempts to construct a TARDIS within the junkyard, that truly sells the story and its ramifications. ‘The Doctor’s Wife’ is Doctor Who at its most emotional, exploring Amy and Rory’s relationship even more while finally giving a voice to that between the Doctor and the TARDIS. The production values add an immense sense of both atmosphere and intimacy to the rather grandiose storyline and threat, and this story is certainly one that will be discussed and remembered for a very long time. While it’s a necessary evil that the TARDIS should go back to being voiceless by story’s end, that time with a voice is certainly not wasted and gets to the very heart of the Doctor and his travels with his one unchanging companion.